You are here: Home » 2011 » August » Is the Motion J3500 still the best Win-Slate on the market? To borrow a phrase from Tommy Lee Jones in The Fugitive, I’ve been doing a “hard-target search” recently for a new tablet PC. Don’t get me wrong, I love my Lenovo x201 Tablet PC, but I really want to try another slate. In my mind the ASUS Eee Slate EP121 (who comes up with these names?) 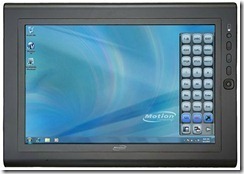 is currently the best tablet PC slate on the market. I’ve spent quite a bit of time messing around with it at the Microsoft Retail Store at Bellevue Square in Washington. The employees in there must think I’m some kind of stalker. As far as the EP121 goes the inking is great, the touchscreen responsive, it’s fast, it’s the perfect size and it just “feels right” in my hands. So what’s the problem? The battery life is terrible? The information on the tablet states that the battery life is less than 3 hours. Online reviews have it at about 2 hours. That’s ridiculously bad in this day of hi-tech. 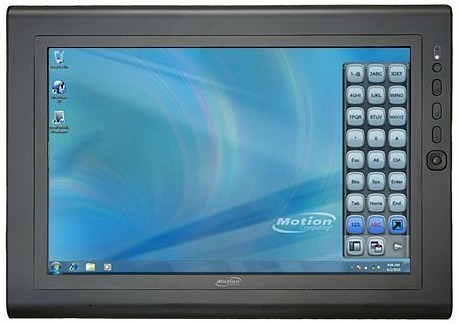 I looked hard at the Motion Computing CL900, but just don’t think it has enough muscle for me. It’s a bit slow and clunky. That’s a bummer as on the surface the CL900 looks like the perfect device. While rummaging around the Motion Computing website for information on the CL900 I stumbled across an old friend, the Motion J3500. I’ve used it’s predecessor, the J3400 before and it was a great machine. I found the J3400 to be a good mix of functionality, toughness and battery life. With upgrades to the hard drive, processor and display the J3500 may just be the best option currently available, which says something about the tablet market; the J3500 is over a year old.